London - Natalie du Toit cruised to a gold medal in the women's 400m freestyle S9 heats, improving on her earlier heat by two seconds at the Paralympic Games on Tuesday. Competing for the last time at Paralympic level, she led from the start and increased her lead at each turn, touching in 4:30.18. She was almost a full 10 seconds faster than her nearest rival, Stephanie Millward of Great Britain, who touched in 4:40.01 while Ellie Cole of Australia took bronze in 4:42.87. Du Toit, who now has 12 Paralympic gold medals to her name, including her unbeaten world record time of 4:23.81 set in Beijing, dedicated Tuesday's medal to Cathy Doyle, former president of Central Gauteng Aquatics, who died a few months ago. "Cathy was supposed to be officiating here and it's very sad because she was at the last world championships by the side of the pool," Du Toit said. "I try and picture her sitting there on the chair and the whole idea for me was to swim the 400m for her. She really helped me in the province and I want to dedicate this medal to her and to her family who are still supporting me even in their time of grief." 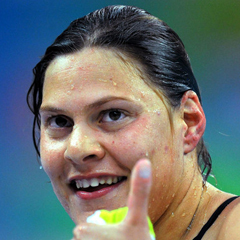 Swimming in one of her "safe" races, Du Toit said the greater the distance, the more chance she had of winning it. "The longer the distance the better it is for me. Tomorrow is the 50m freestyle, which is a bit of a blink of an eye and anything can happen. "It will be tough as I haven't been under 30 seconds in a while and the arm amputees have improved tremendously since we got the new blocks. I need to just go out there and give it my best." Emily Gray ended seventh in the same race, setting a slightly better time than her morning heat, in 4:59.77. She said the experience had helped her tremendously and she would start working towards Rio de Janeiro in 2016. It wasn't a personal best, but I tried my hardest so I couldn't really do more. "The call-up room gets quite intense so I'm learning to soak up the pressure and also learning to handle the crowd and use them as energy. "The South African support is huge. It was so awesome to see the flag while I was swimming and it just made me push harder." Shireen Sapiro, was unable to defend her crown in the women's 100m backstroke S10 final, but set an African record for a bronze medal in 1:09.02. "I have to be happy as I swam a personal best," Sapiro said. "The standard of the sport has been raised so much in the last four years, so I knew I would have to fight like I've never fought before. "I can't ask for more as I gave it my best shot, but coming into the race as defending champion put a lot of pressure on me. I've been through so much in the last four years, so for me to come here and still be competitive is such an amazing feeling." Canadian Summer Mortimer set a new world record in 1:05.90 for the gold medal. Sophie Pascoe of New Zealand, who led for three-quarters of the race, had to settle for silver in 1:06.69. Charles Bouwer came fifth in the men’s 400m freestyle S13 final in 4:14.13. As expected the race was won by Ihar Boki of Belarus who bettered his earlier world record by four seconds, winning gold in 3:58.78. Ukraine's Danylo Chufaraov took the silver medal in 4:05.85 with Russian Aleksandr Golintovskii winning the bronze in 4:11.13. South Africa have dropped from 20th to 22nd the competition, with three gold, five silver, and seven bronze medals.